Leadership coach and former state legislator Donna Zajonc argues that we must go beyond the traditional two party system. 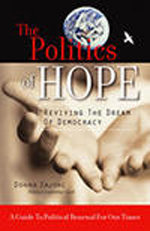 In her book The Politics of Hope: Reviving the Dream of Democracy (2004) she takes a look at our current political system and how it leads to a stalemate between the two parties. Only if public leaders focus on non-partisan collaborative methods and shared respect, can we move towards positive resolutions of national issues. A reader says about the book: "Donna Zajonc's practices for political renewal and servant leadership apply not only to politicians, but to any leader seeking higher ground. Keep (The Politics of Hope) beside your bed, read it, use it, and you'll never see the word politics in the same way again." Donna Zajonc, with husband David Emerald Womeldorff, is co founder and current head of the Bainbridge Leadership Center. For more information go to http://www.bainbridgeleadership.com/books.html.